If you want to increase the amount of omega-3 fat in your diet, the best way is to eat more fish such as salmon, trout and mackerel. Eating broiled, baked or steamed fish two to three times a week is a good way of increasing the omega-3 fat in your diet. Last Tuesday I went to the the farmers’ market and got some nice salmon fillets. When I have fish I want it to be eaten on the same day but before going to the market I had already cooked so I had to leave it for the following day. When I bought the fish I had no specific recipe in mind, so as soon as I came back I checked my drawers, the cupboards and the refrigerator to see what ingredients I could use. I have tons of spices as each time I go to the supermarket and see something new, I add it to the basket. My new acquisition is tarragon which I used in this recipe. I marinated the fillets and placed them in the refrigerator until noon the other day when we returned from Lake Vouliagmeni. The dish was ready in 15 minutes. Wash fillets and pat dry. Place in a bowl and add dill, garlic, zest, spices, cider vinegar, lime juice and fish sauce. Make sure that all fillets have been wet. Rub all fillets and cover with the remaining dill. Wrap in cling film, crosswise so that it does not leak and leave it as many hours possible, but not less than three hours. Heat olive oil in a sauteing pan, remove dill and saute on both sides, adding all juices from the marinade. (If you like you can also grill the fish). Squeeze some lime juice on top before serving. I had lots of leftover dill so I decided to make it into a pesto with cashew nuts. Cashew nuts are significant sources of iron (essential for red blood cell function and enzyme activity), magnesium (promotes energy release and bone growth), phosphorus (builds bones and teeth), zinc (essential to digestion and metabolism) and selenium (has important antioxidant properties, thus protecting the body from cancer). These nuts are also good sources of protein. Cashew nuts also contain significant amounts of phytochemicals with antioxidant properties that protects the body from cancer and heart disease. We all know the properties of olive olive. I have written about this in a separate post about Mediterranean Diet. Put the dill, nuts and garlic with half of the olive oil, lime, salt and pepper in a food processor and mix. Add the remaining olive oil and cheese, and process until blended. If you like fish, you may find more fish recipes in my post for Healthy Recipes. 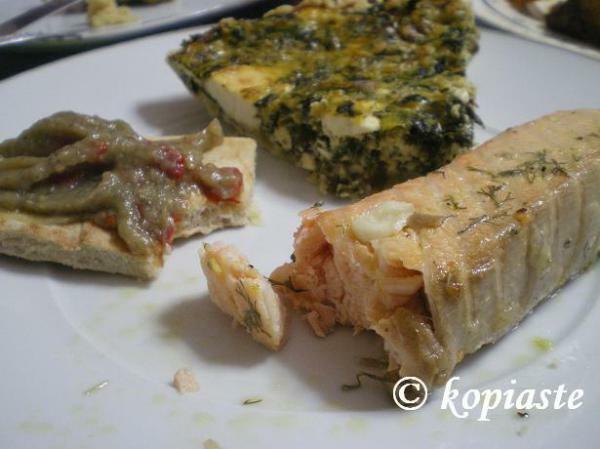 Salmon and dill and spices…it sounds delicious! And the beet salad looks very pretty. Everything you made looks fantastic! I’m not sure which part I want to make first! I love grilled salmon, and dill is such a great addition! Thanks for sending this to Monthly Mingle. I love the idea of the grilled salmon with pesto. Hi Emiline, Mary, Sig and Cynthia. Thanks for your comment. What a great combination of the salmon and the dill…and the beetroots…the whole thing looks like a marvellous feast! Thanks Peter, maybe I get lucky with the combinations or my instincts are good or I have learned a lot from blogging. I want to believe that all of us reading so many recipes every day for a long period (in my case nearly a year)we now know what to reject and what to use. Vani, your comment was playing hide and seek. It just popped up. Thanks. Ivy, the piece of salmon in your photo is known as a steak, a fillet is flat, pin bones removed. Dill is a natural for salmon and I’m delighted to learn you found estragon (tarragon)…also wonderful for fish and poultry. Peter, I knew that it was a steak and I mentioned it further down in the ingredients. It seems that I was dreaming of fillets while writing the post or I was too tired, near midnight. Any way thanks for letting me know. Actually the first comment was from Mansi who although saw the salmon mentioned that it was chicken. I e-mailed her back to send me a corrected comment but it seems that she is trying to prepare the round up. I am looking forward to trying tarragon. Grilled salmon is absolutely great. The idea with the pesto is fantastic perfect for a nice BBQ. Thanks for joining us at the mingle! Thanks Meeta, it was my pleasure. Thanks Jenn. You are right and so easy as well. I wish this had have been waiting for me to enjoy on the BBQ after work. I do have a salmon fillet in the freezer so I will have to get on that ASAP. I hope you enjoy this Val. Looks like a beautiful pseudo-pesto :). Psychgrad, thanks for the name pseudo-pesto. Sounds delicious and so innovative. I would like to invite you to participate in my ONE DISH MEAL- Salad event. The rules for the event is in my website. Will look forward to a recipe from you.